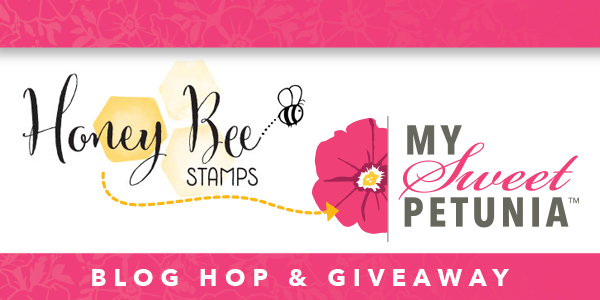 Welcome to the Honey Bee Stamps and My Sweet Petunia Blog Hop. What would a hop be without a giveaway! 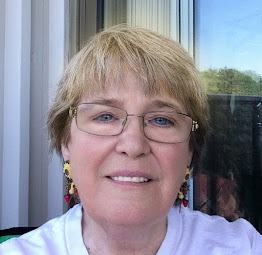 From My Sweet Petunia a chance to win either a Mini or Original Misti (winner's choice), and from Honey Bee Stamps a chance to win a $45.00 Gift Certificate. Be sure to visit each blog and leave a comment for your chance to win. The winner's will be announced on April 7th here at the My Sweet Petunia Blog. The winner for Honey Bee Stamps can email Melissa at hello@honeybeestamps.com. 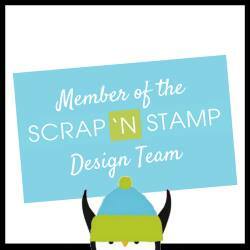 So, visit the fabulous designers on both teams and leave a comment (one per blog please) for your chance to win. On to the cards I did for today. I had such fun making these cards, all made so easy using my Mini and Original Misti's. For the bunny cards I set up my Original Misti using the ruler square and Creative Corners as I like to bring my panel into the center to work easily while I water colour. 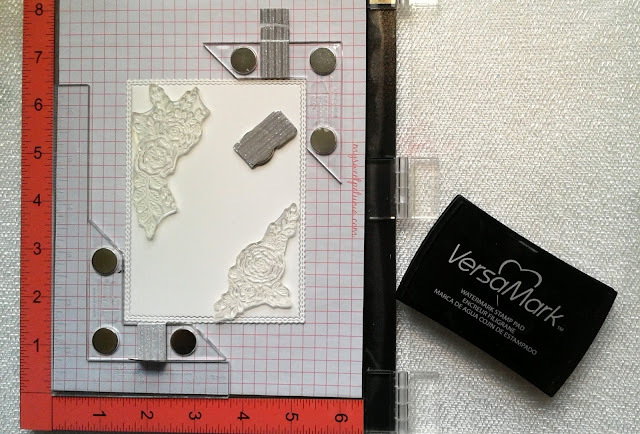 To stamp, I arranged the Country Blooms stamps using embossing ink and heat embossing with white embossing powder on water colour paper which I die cut with the rectangle dies. I put the panel back in my Misti to water colour and use my Creative Corners to keep my paper secure while I colour with my Zig brushes. 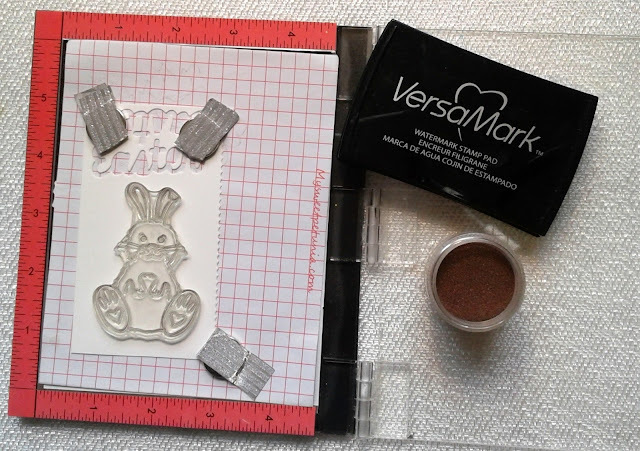 For the bunnies, in my Mini Misti I stamped one with intense black ink and the other I heat embossed using copper embossing powder. I water coloured both bunnies using my Zig brushes and fussy cut for my cards. As you can see here, I also used the same piece of water colour paper to die cut my Easter sentiment. I styled the bunnies and attached to the card base on foam dots and added some Wink of Stella to the ears and the paws. I die cut the "Easter" in water colour paper and painted the bottom in a coordinating colour to shadow the top sentiment, then stamped the "Happy" with Tim Holtz Distress Ink Brushed Corduroy. To finish I added my trademark sequins. For my third card, I used my Mini Misti to design the card and stamp the little scene. The oval die is on foam strips, and I used Zig Brushes to water colour, also adding Wink of Stella along with more sequins. I hope you have enjoyed these cards, and now it is time to hop on over to Laurie Case. Products: Mini and Original Misti; Honey Bee Stamps Country Blooms, Spring Honey Buddies and Kindness Stamp Sets; Frantic Stamper Deckled Rectangles; Memory Box Scallop Stitch Trimmings; Simon Says Stamp Stitched Rectangles; Taylored Expressions April Script; Simon Says Stamp Intense Black Ink; Versamark Embossing Ink; Altenew Tropical Forest Mini Cubes; Zig Clean Color Brushes; Wink of Stella Brush; Neenah Cardstock; Fabriano 140lb Hot Press Water Colour Paper; Sequins; Foam Dots/Strips. That bunny is absolutely adorable! Great cards! Love the coloring of the flowers on the first two cards as well as the double cut of the sentiment. Very nice. Oh my gosh!! I am so in love with all of them! The coloring is so beautiful. I would love to receive all of these for Easter no matter what age I am. Very pretty cards, Kia. I like the flowers stamped with their tiny leaves; it gives such a delicate touch to the cards. Cute bunny, great coloring and the lamb is adorable. Like how you paired them with the Easter die and your fancy edged dies around the card fronts. Adorable animal stamps. Beautiful cards. Thank you for sharing. Using the T ruler with the corers is a great idea. Your card is lovely with great techniques. Awe - cutest cards in the hop! I love how these turned out! 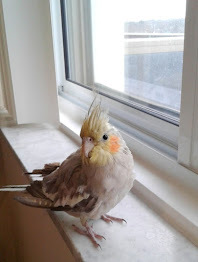 Your colors are so pretty - and spring like! Thanks for sharing! Adorable bunny and beautiful coloring. What did we ever do without our MISTI and Creative Corners. I have started coloring my images while nice and secure with my Creative Corners :-) TFS my friend. Hugs.. These cards are so darn cute! I love how the flowers are so perfectly positioned - can't go wrong with the MISTI! I received my Creative Corners in the mail this morning and now I am off to watch videos and play. Oh my gosh, these cards are so darling. Love them both. Cute bunnies! Just in time for Easter. The flowers are colored beautifully. Nice hint to use both the ruler and corner! 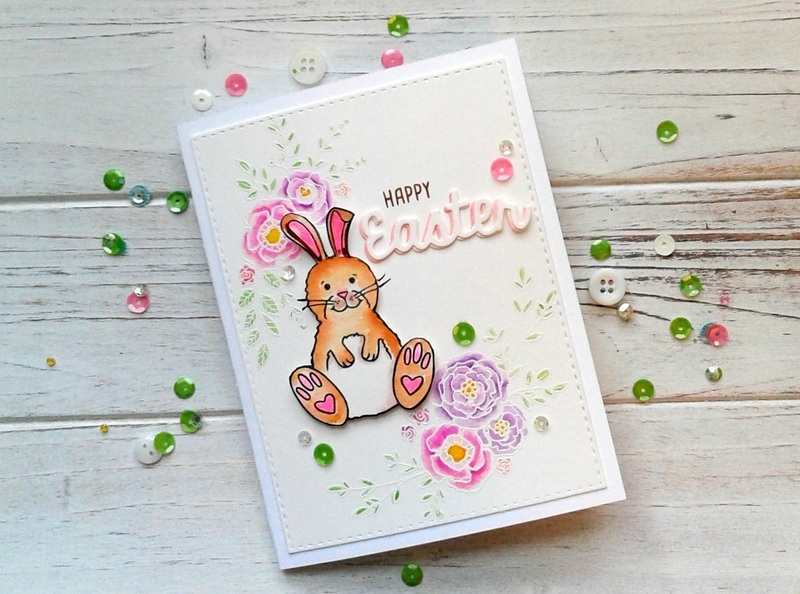 I like how you did the "shadow" on the word Easter - looks very nice on the card. What adorable stamps and card So! Your cards are adorable, love the backgrounds! What a charming bunny card. Happy Easter, indeed ! Very Nice. Love all 3 cards. Eeee I love the cute bunny! Beautiful and fun! Love your sweet Easter cards. The lamb and bunny are adorable. Your cards are so cute. These are fantastic and cute! Your bunny is SO perfect! :D I adore it! Oh Kia, your cards are precious! 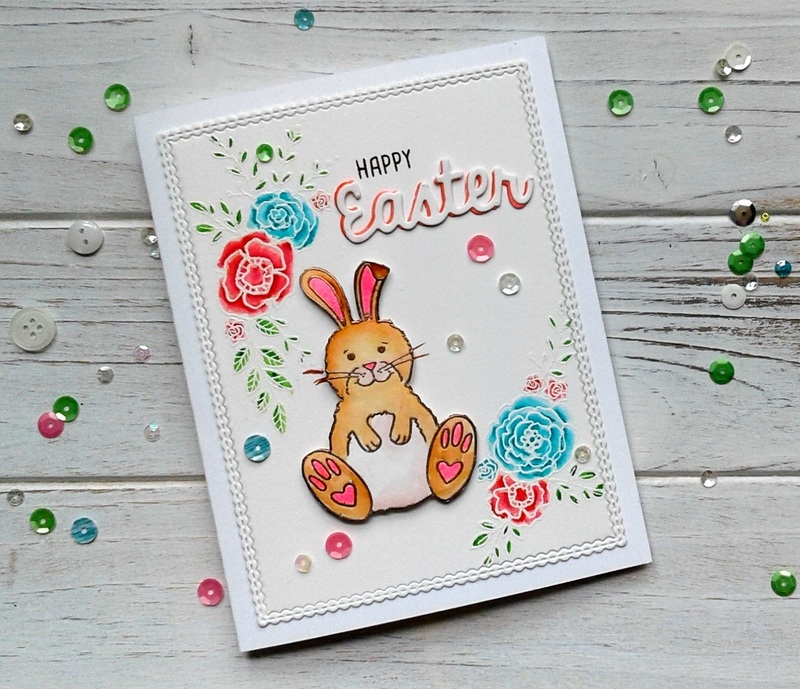 I especially love the bunny cards and your colouring with the Zigs is amazing! A wonderful job on all of them! What a cute bunny. Awesome card. Ooooh, how adorable are these? Love them! And it's great to see how much of a difference a different choice of colour can make! Awesome cards! Great idea to watercolor in the Misti! Love your cards! They are so cute! This is very cute and a great card for Easter. Thanks for sharing! Very sweet cards. All so perfect for spring. I love the sheep! These are both so cute. Put a bunny on anything and it is a winner with me. Those baby animals are adorable! Very nice cards. love your card and would love to own a misty. Darling cards Kia. Love the pretty flower images in the background. The bunnies are so sweet! Also love the little lamb... great designs. Kia, your little critters are so adorable! And I love that you showed us how to use Misti corners. Thanks! Adorable Easter cards! Love the sweet critters and your pretty coloring and details! Super cute cards! What a happy combination of sweet and beautiful on the bunny cards. I love your cards they are so cute. I love the bunny one. These cards are so adorable.Very nice use of the misti corners. Such great, cute cards. Thanks for sharing. Very adorable way to create these sweet cards. Wonderful coloring! I love Honeybee's floral images and they make a wonderful frame for Easter cards. Such adorable cards. Thanks for sharing with us. Wow. They are cute cards. Love your coloring with the letters, too. Thanks for sharing. That lamb card is so cute but those bunny cards are just gorgeous with those painted florals in the background!! 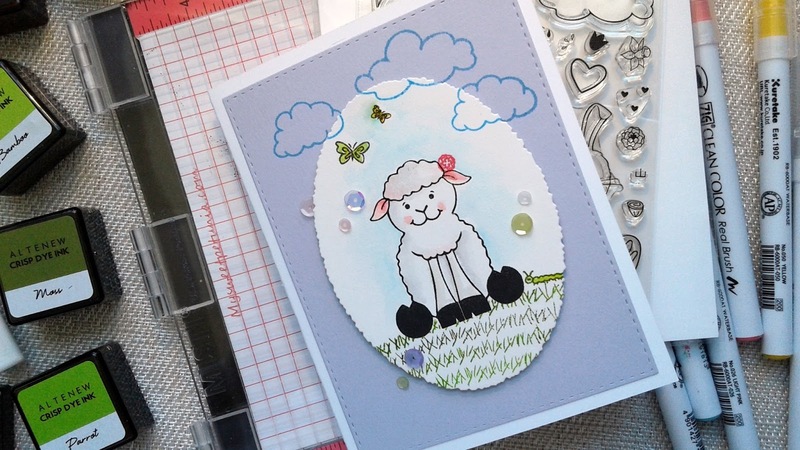 What pretty cards, perfect for Easter or spring! Thanks so much for sharing. Those cards are just adorable! Cute bunny and good colors. Thank you. Beautiful coloring! I love how you layered the stamping! Thank you so much for the inspiration! Wow that bunny card is sooo ADORABLE!!!! Super cute Easter cards. Thank you for sharing. Sweet sweet cards and great colouring! TFS! These easter cards are so pretty! I love the whimsical images and the great color! Just adorable. Thanks for sharing. That little bunny is so sweet. This hop has so many great ideas! Such sweet and adorable cards!! I Really love the flowers on the first two!! Oh my goodness!!! Such adorable cards!!! Absolutely cute!!! Love how you've combined pretty and cute. It works. Thanks for the MISTI accessory tips. I love the layout of the stamp set. Such cute cards! 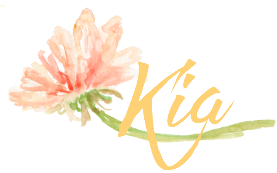 It's wonderful to learn new things in each blog hop! Thank you for sharing your inspirations! The bunny is very cute! Nice coloring! I can't remember how I used to stamp before I got my Mini MISTI. It's such an awesome tool.